Fail to prepare, prepare to fail! I don’t necessarily agree wholeheartedly with this Leaving Certificate throwback but I do feel that preparation is key to making your life easier and that of your Fashion Shoot. First and foremost, it is important that there is open communication throughout the whole Fashion Shoot process. Creating a Facebook group can make it all the more easy. If you already have a group for the Brand Ambassador’s on your campus that is great (more people can always be added when the group grows). 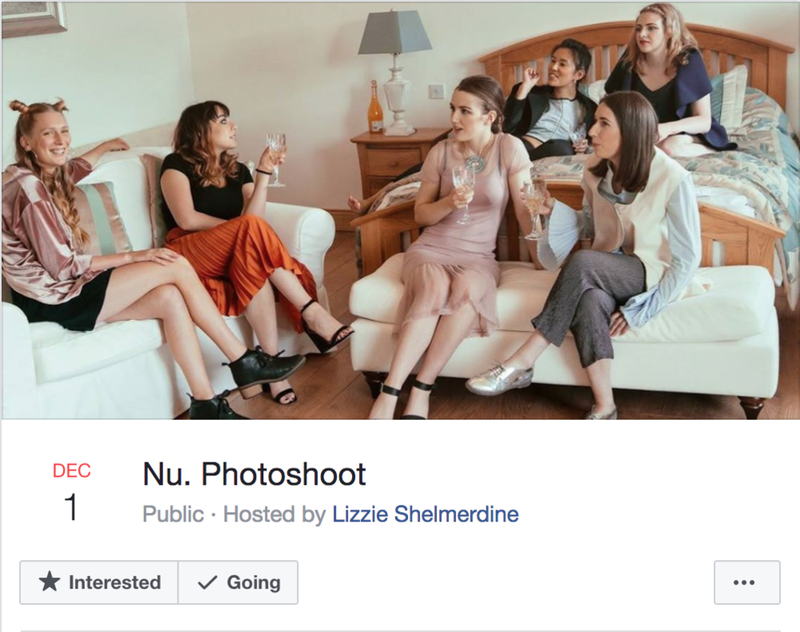 I like Facebook for organising the shoot because you can incorporate different tasks very easily by tagging the name of the person who has volunteered to act as ‘photographer’ or ‘stylist’ and create polls for deciding the best day to suit all schedules. Here you can organise where you will meet to discuss everything, where you will organise the clothes on the day and which will act as your ‘place’ for the day of the Fashion Shoot (a place close to getting food and a bathroom would be perfect). We want to share the message of Nu. to as many people as possible so that our community can grow and make a difference. By involving other clubs and societies on campus, the Students Union or even other groups and organisations off-campus in your community, you can help us to achieve this. Maybe you can get help from a Media Society to get a high-quality video of the shoot or source extra models from the Fashion Society or even some more facts and figures from Environmental groups and local organisations. Even those who study Business or Law could be interested in helping out and spreading the message of an alternative Fashion business model and the human right issues associated with that. The fashion industry crosses over with so many other elements of society that it would be such a shame not to include other members of our communities in our journey. A week before the set date for the shoot (or however long you have), the first thing to consider is: ‘what is the theme of the fashion shoot?’ Is it party season, music festival, one dress & thirty wears or capsule wardrobe? Whatever it is, it is important to centre the shoot around a theme to provide focus and continuity across the shots. If you are not too sure of what theme to go with, any of the Nu. Brand Ambassadors will be happy to help. Pinterest and Fashion look-books are also a great resource to get inspiration flowing. Before you begin the shoot it is always a great idea to decide where you want to shoot. Natural daylight is generally the best option for getting clear and flattering pictures. Select around 3-5 locations for your shoot (more or less depending on the size of your Fashion Shoot). Consider the distance between each location and practicality of getting from one place to the other and the time it would approximately take in between. Taking photos of each location at the time you plan to start the Fashion Shoot is also useful. This will help you decide which outfits are suitable for each location and what sort of light you will have at that time. The amount of models you want to include in the shoot really depends on how much time you have and how large or small you wish the shoot to be! It would be great to involve as many Nu. Brand Ambassadors as possible in the fashion shoot. This way they can get nice pictures taken of their clothes which can be uploaded to their Nu. profiles. If you know of anyone else who might be interested in participating, invite them along. This will help spread the word about Nu. and hopefully will invite more people to join and to upload to the platform and eventually prompt to borrow items. Also remind the models and anyone working on the shoot that day (e.g. Photographer, Stylist) to bring comfortable shoes (for models to wear also between locations), a warm coat and gloves or even a raincoat/umbrella if necessary! If the shoot is running over-time or longer than anticipated, having snacks and drinks in your bag will be great to keep spirits and energy levels up. When you have the models selected and the theme in mind, you need to select any clothes/shoes/accessories that will complement that theme. Don’t underestimate the power of a bag, a piece of jewellery, a belt or a hat to add interesting texture or edge to an outfit. Before the day of the shoot, ask the models to organise around 3 outfits each, relating to the fashion shoot theme. If the theme is ‘Party Season’ for example, ask the models to include a range of pieces that could be considered as a more casual party look and other pieces which would be more suitable for formal events. This will provide interest to the shoot while keeping within the theme. It would be a good idea to style the looks so that when people see the images they think ‘Wow, I would definitely wear that!’ or ‘That’s so cool, I would never have thought about wearing that dress with that jacket!’. This will provide interest and inspire people to start borrowing and creating different looks too! It would be worth asking the models Also ask the models to bring with them any accessories or shoes which could complement their looks or could be good for the shoot in general. If the models want to wear makeup, ask them to do it before arriving at the shoot. This ensures greater time efficiency. The same can be asked of hair. A good idea is to have a basic make-up look done first, so it can complement all looks. If you want the look to be more dramatic or defined as the shoot goes on this can easily be done with a different lip colour or eyeliner. Keeping the weather in mind, bringing hair-spray, a hairbrush/comb and hair clips may come in handy if it is particularly windy or for updating a look by pinning pieces of hair back to show off the front of a dress, or interesting collar detail on a shirt. If any of the shots are close-up, I would suggest keeping nails natural as the focus is on the clothes. However, if the photos are being taken from afar, wearing nail varnish shouldn’t be an issue. I really do believe in wearing whatever makes you feel most comfortable. The most important thing is to have fun! Enjoy the experience and let loose. Being involved in a Fashion Shoot is a great experience. If you find that you feel in any way awkward just keep moving during the shoot and talk away! This will help create a relaxed atmosphere. If you are in a place where music can be played (without annoying anyone else), by all means, go ahead and do so! Aside from this, the next set of tips will ensure a smooth-running day! In order to have a stress-free day, allow enough time during the day to get everything done. Don’t try and cram in too many things at once, otherwise, this will only cause unnecessary anxiety when the day should be exciting and fun. For example, if the shoot is scheduled to start at 2pm, why not ask the models to bring their outfits to the stylists between 11.30am and midday? This will allow time to organise and prepare the clothes as well as time to have lunch. Bear in mind the length of time it takes to get to each location and how long you will need to get the shots you need per outfit. Ask everyone to bring whatever hangers they have with their clothes on the day! Even better if they are wooden Nu. inspired hangers. Hanging the clothes up will allow you to see each item clearly and keeps everything organised. It will also allow you to steam the clothing to ensure the clothes look their best. In order to further protect the clothes, particularly if you are going outside, bring some garment bags so that the clothes will be kept pressed and dry. If you have a large number of outfits, bring labels to attach to each piece with the name of the model or take pictures of the set of clothes with the name of the person they belong to. It would be a great idea to organise the outfits according to the locations you will be shooting at. Think about which place is furthest away and consider having that as your first location and then back-track towards the location closest to where you originally met to organise the shoot. Then you can sort out which outfits will be worn where. The outfits that will be worn last can go at the bottom of the pile and those which will be worn second on the top etc. It is a good idea, in order to save time, to change into the first outfit at the meeting space and then, walk/drive to the first location in that outfit. Fashion Shoots are so much fun and this fun should be shared with others! Not only will it create a good buzz around Nu. it will also show how lending and borrowing clothes is a fun, easy and cost-effective way to shop and meet different people! We recommend having somebody, other than the photographer, who can take behind-the scene footage of the fashion shoot. Sharing the fashion shoot on Instagram Stories is a fantastic way to draw people in. 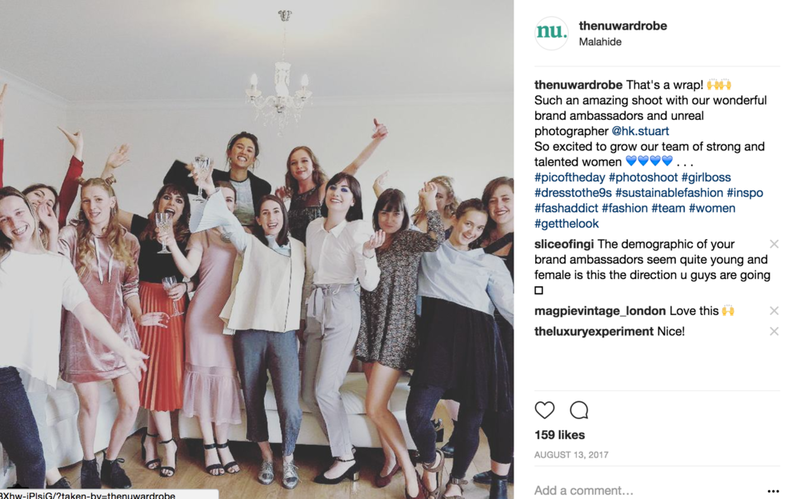 The use of polls and boomerang on Instagram also add a fantastic interactive and engaging element to make people feel part of the Nu. experience and hopefully encourage them to join the community! Expect the unexpected on the day of the fashion shoot! Maybe the heavens break and your mascara goes everywhere (this has actually happened to me before!) or you find that you don’t have the back to that earring you wanted to wear. Remember to include any miscellaneous items which could come in handy such as; face-wipes, earring backs, safety pins, needle and thread, plasters and tissues. If you can think of any other items which have come in handy for you, please leave a comment below to help us all out. Now that you have worked hard and had a successful fashion shoot, it’s time to share the experience with others! This is your chance to showcase everything you have been working towards and create further excitement about Nu. When you have all recovered from the excitement of the day and are ready to start sharing your outfits a good place to start is with the behind the scenes footage collected during the day! Firstly, upload the images to your Facebook groups. Then, if any of the members want to share the images on their social media platform they can. Some people may not have seen the Instagram stories for example, so posting an image(s) from the shoot will ensure that they can be kept up to date with Nu. and its activity, and maybe even will draw them towards the platform. My final tip for you is to share your Fashion Shoot experience through a blog post (this is what I am doing right now for you!). It is so important for us all to help each other out and I am sure that after your Fashion Shoot you too, will have other tips to share with Nu. Don’t be afraid to write about the day, how it went, the funny stories you have from the day and the people you met along the way. These all add to the unique community experience of Nu. I hope that you found value in this post. These tips are intended to provide you with a step-by-step guide to organising a Nu. Fashion Shoot and will, I hope, make the process easier for you. If you have any other tips, please leave a comment below- we’d love to hear them!